I usually cook with recipes. I often make changes, but I like having a plan… a starting point. Recently, I’ve been improvising more. Instead of buying ingredients for specific meals, I’ve been making meals based on the ingredients I have. 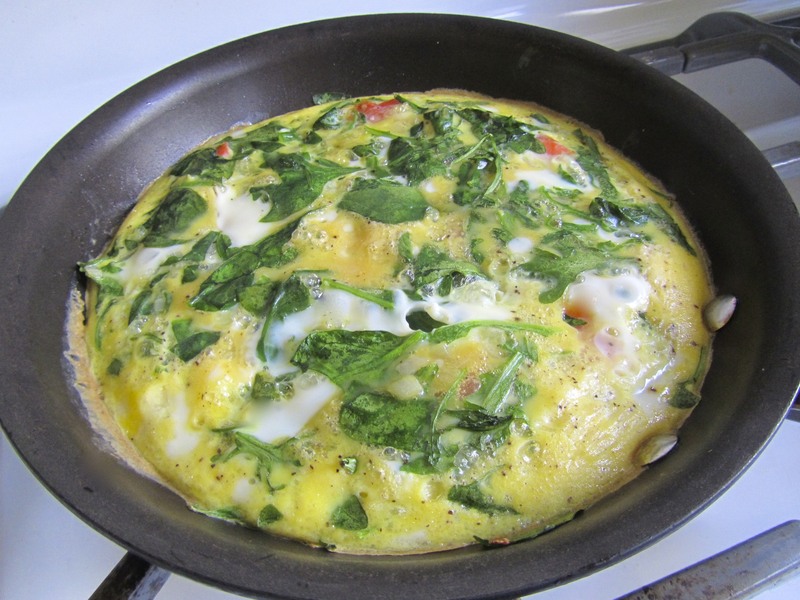 One of the dishes I threw together this week was a frittata with smoked salmon, wilted greens, and shallots. It was easy to make, tasted great, and was easy to reheat the next day at work! Preheat oven to 350 degrees. In a medium sautee pan, heat olive oil over medium heat. 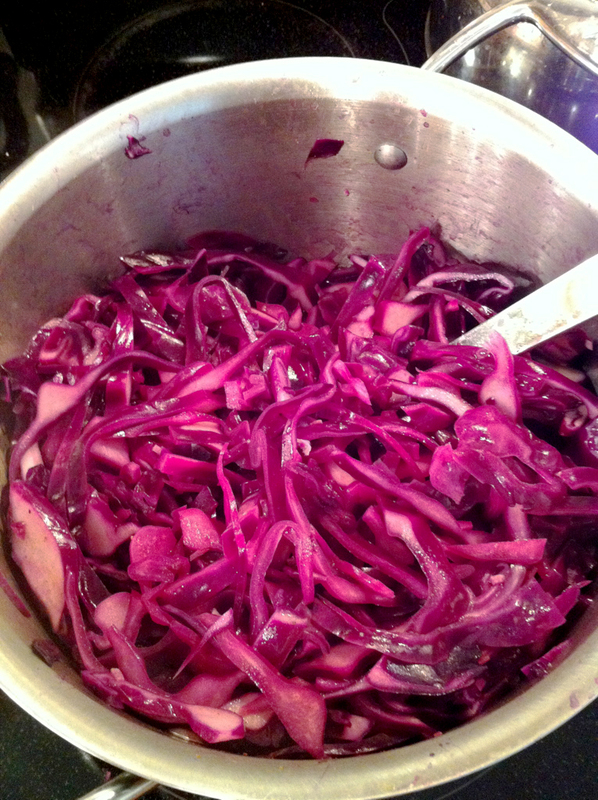 Add shallots and cook until softened, 3 minutes. Add greens and cook another 1-2 minutes, until the leaves begin to wilt. Toss in smoked salmon, and cook 1 minute. 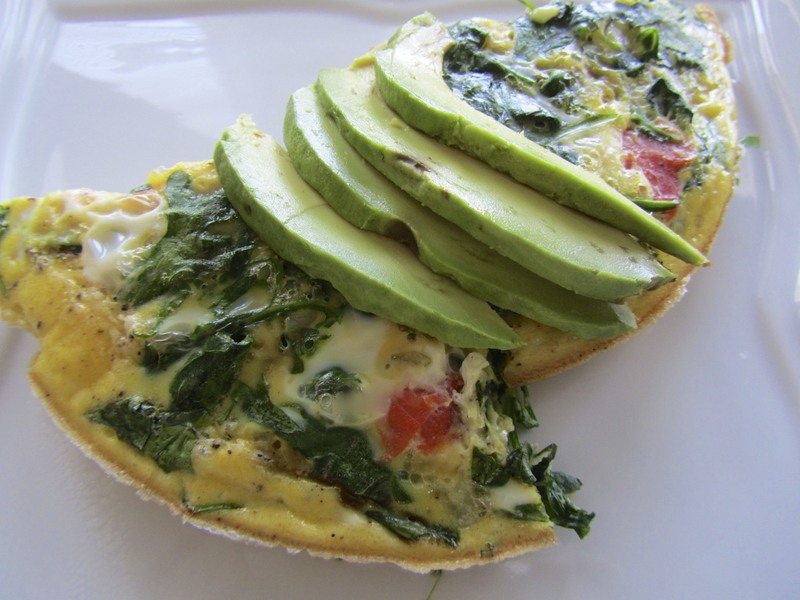 Pour in eggs and cook until eggs start to set, 3 minutes. Transfer pan to oven and cook 10-12 minutes, until eggs are fluffy and coked through. Season with salt and pepper, slice, and serve. **I garnished my plate with slices from 1/4 of an avocado. This week is Bay Area Dance Week, so in addition to my usual jobs and classes, I’ve had extra rehearsals and shows. Quick meals have been very much appreciated! 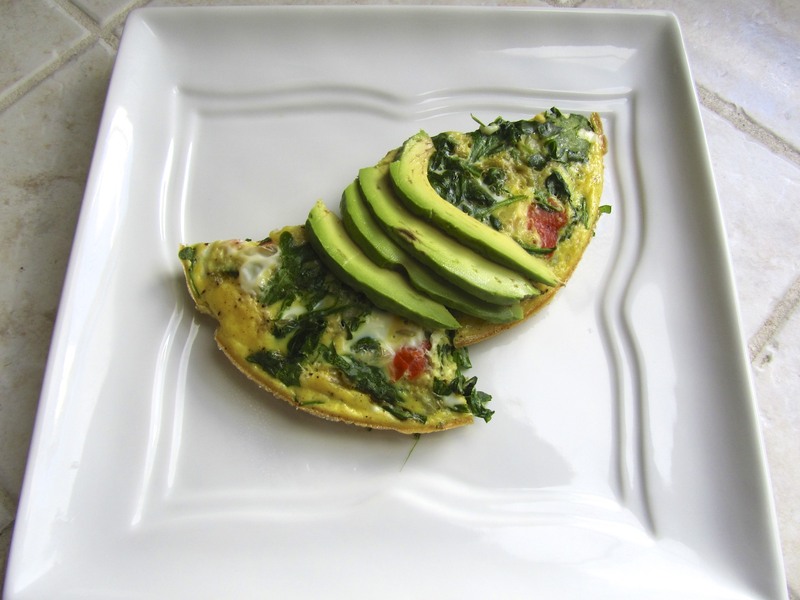 What are your favorite fast meals? As I mentioned last week, I’ve been following a modified version of the Food Lover’s Cleanse from Bon Appetit. I’m now on Day 11 out of 14, and have gotten more flexible with my interpretation of the meal plan as time has gone by. Even so, I’ve been making better decisions, I’ve successfully cut back on my coffee intake, and I’ve felt generally more healthy. Here are some of the highlights of the past week of my “cleanse”. 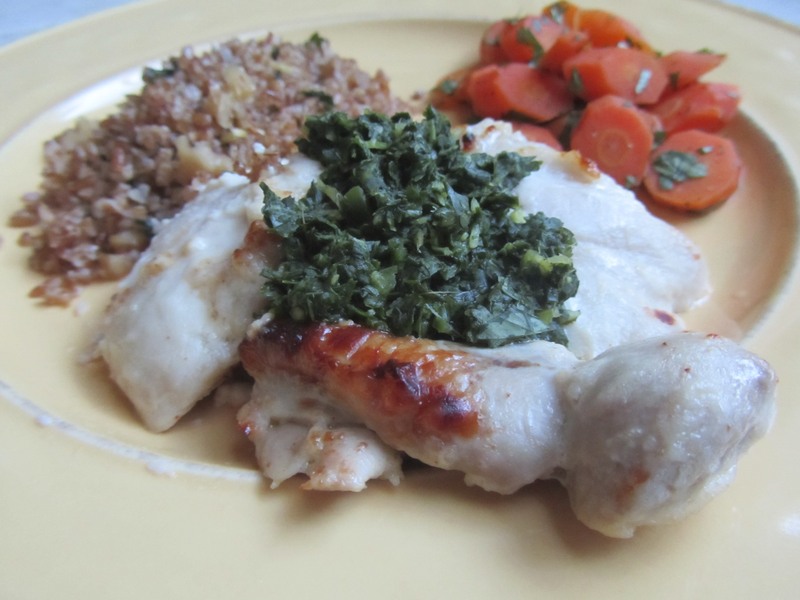 For dinner last Wednesday, I made yogurt chicken with ginger-cilantro chutney and carrots with mint (both recipes on Day 3 on cleanse plan), and served them up with the last of my bulgur with parsley and lemon. The chicken was moist and full of flavor. I’ll definitely make it again! Thursday was a series of leftovers and repeat dishes, most of which were enjoyed whilst sitting at work. 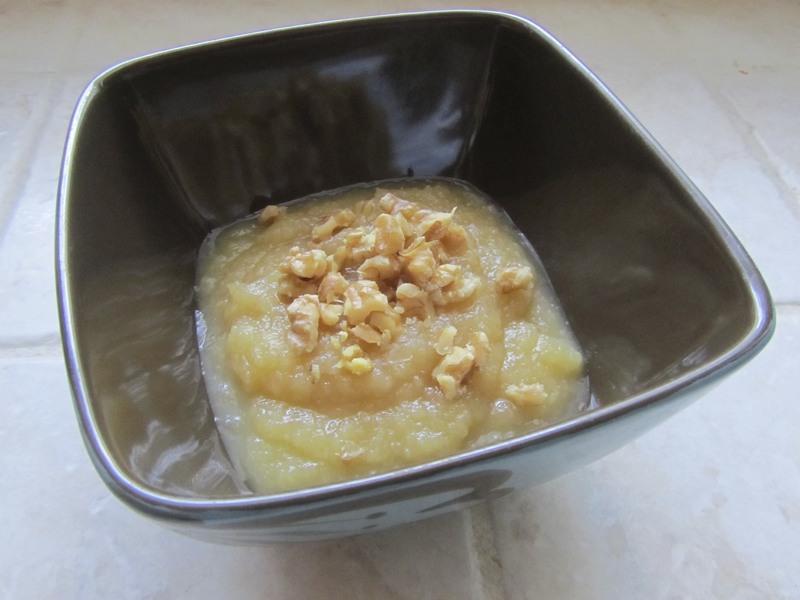 Friday, my afternoon snack of applesauce with walnuts was surprisingly enjoyable! I want to make my own applesauce, and make this a more frequent treat! 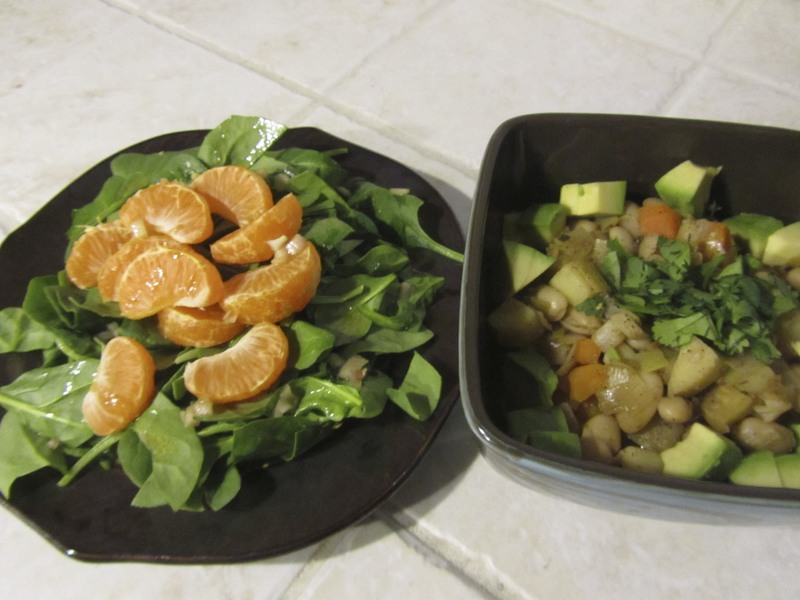 For dinner, I made white bean chili with winter vegetables (recipe from Day 5 on cleanse) and a spinach salad with clementines. I loved the avocado on top of the chili. It was a fresh and creamy addition to the complex flavors of the chili. I had a long shift on Saturday, so I packed up a fruit salad and almond milk for breakfast and a big salad with kale, smoked salmon, tangerines, and radishes for lunch. I took a break from the plan that evening, and went out for a drink and dinner with one of my girlfriends. 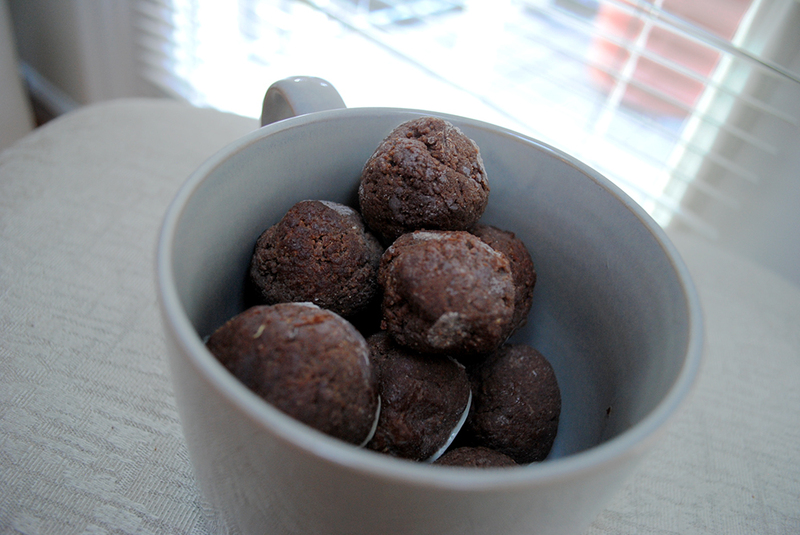 Sunday’s breakfast was a new twist on my usual bowl of oats. 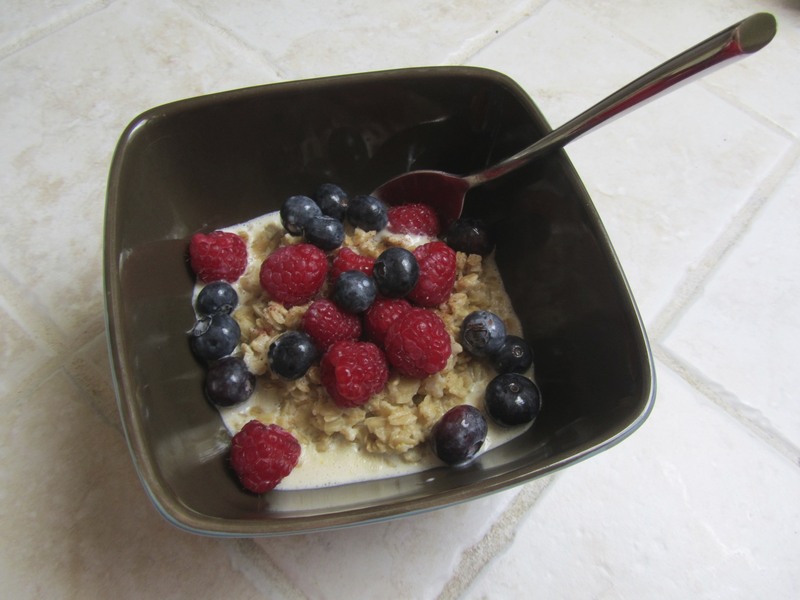 I cooked the oats in almond milk (nothing unusual), mixed in some berries while the oats were still cooking, and topped it off with fresh berries and a bit of chopped sage. 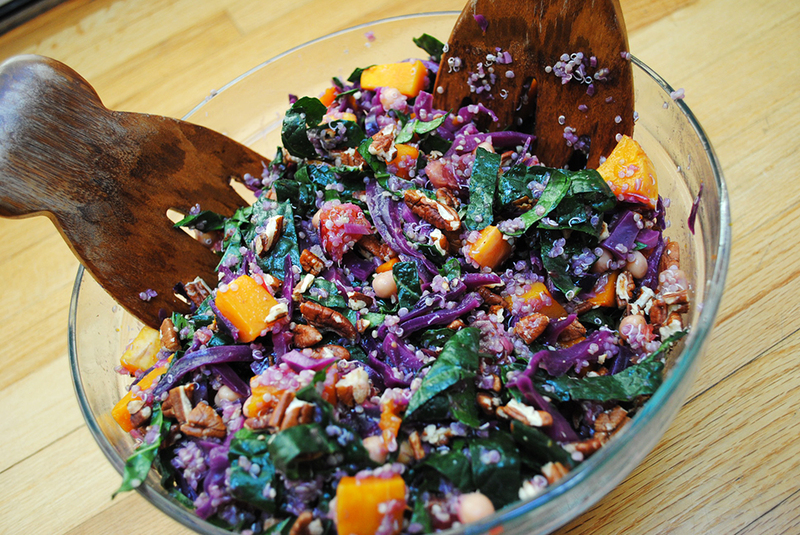 The sage added an extra oomph to an otherwise basic bowl. Afternoon smoothies are definitely going to become a more regular thing for me! 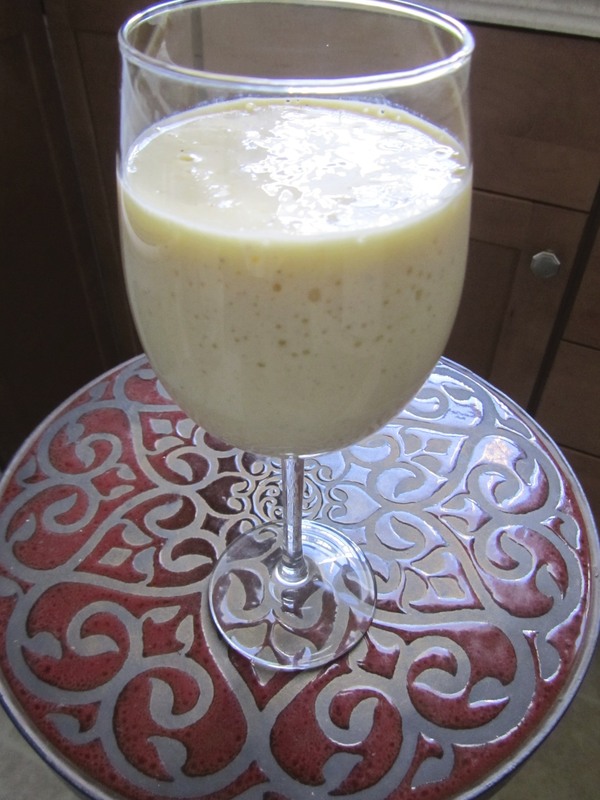 Sunday I made a mango lassi with one mango, some Greek yogurt, a pinch of chile powder, and a dash of salt. I used up all of my leftover produce from the week in a giant dinner salad! 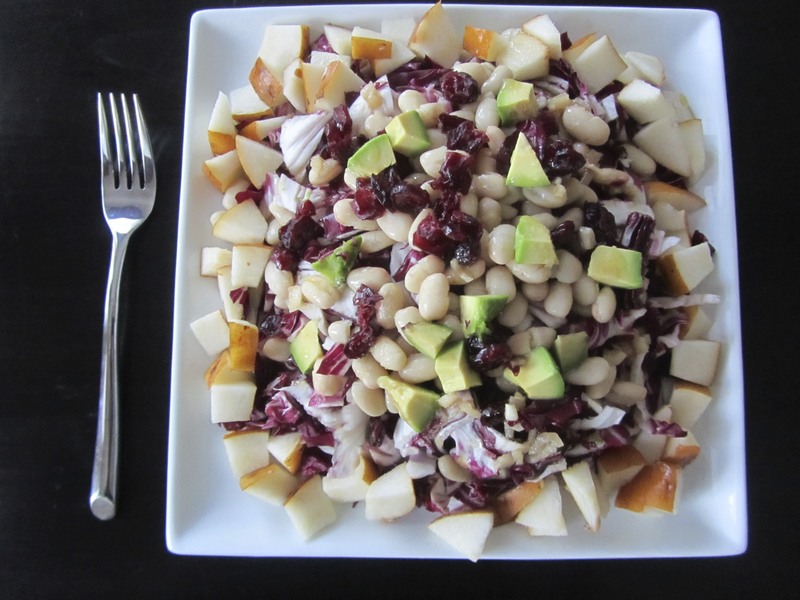 Radicchio, pear, avocado, and dried cranberries were mixed in with sherry shallot vinaigrette and white beans. Yum! Monday was another crazy workday, so I packed up smoked salmon and avocado on rye crackers, an apple, and a big salad with chickpeas, arugula, clementine slices, tahini dressing, and a leftover dollop of ginger-cilantro chutney. 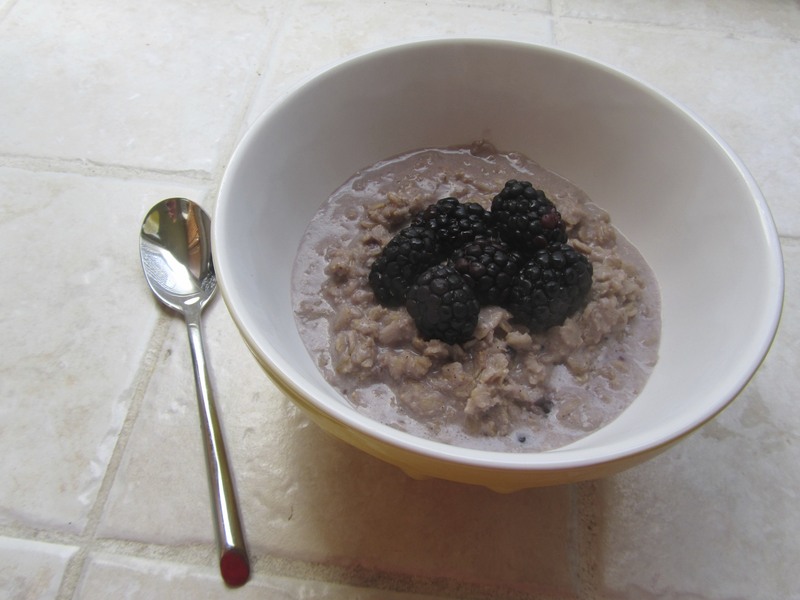 I’ve enjoyed mixing up my breakfast routine, but I still always enjoy a nice bowl of oats in the morning! 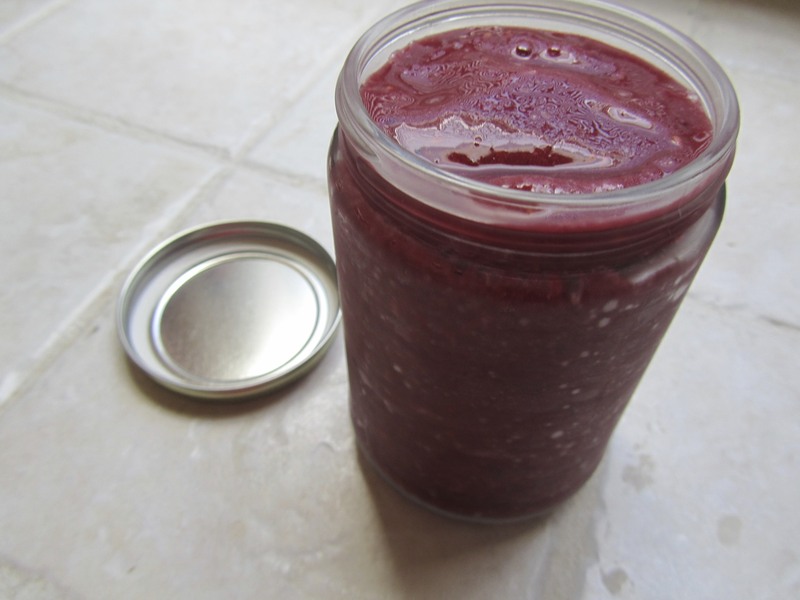 I kept the berry theme going with a smoothie later in the day, made with apple cider, half a banana, and frozen raspberries and blackberries. 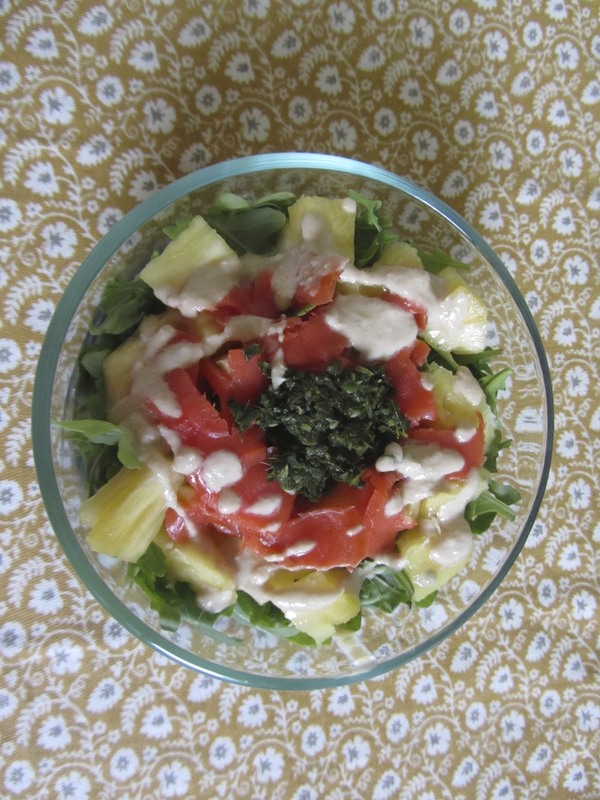 For lunch on the run, I had another “clean the icebox” type of salad, using pineapple, smoked salmon, arugula, tahini dressing, and the last bit of ginger-cilantro chutney. 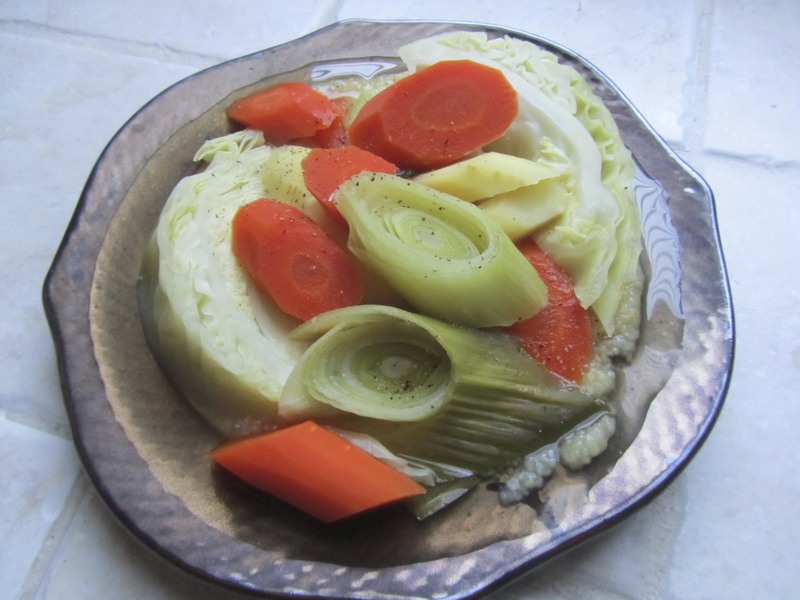 Dinner, vegetable pot-au-feu and soft thyme-scented polenta, was listed on Day 11 of the cleanse. I am realizing how much I LOVE parsnips and carrots. I could eat them every day! I’m looking forward to the leftovers. I love how many fruits and vegetables I’ve been eating! I intend to keep this trend going once my 14 days are up. Even though I haven’t followed the full cleanse, I feel as though I’ve cleaned up my act. Thanks, Jenn for hosting this “What I Ate Wednesday” party! Late in December, I received an email from Bon Appetit about a New Year’s Foodie Cleanse. I bookmarked the details, but was unable to do the “cleanse” at the time. Lately, I have not been listening to what my body needs, and instead have made unintelligent and unhealthy food decisions. I decided to jump-start my return to conscious eating by doing a modified Food Lover’s Cleanse. Based on my schedule, tastes, and single status, I have edited the meal plan. I started on Sunday, and have enjoyed it so far! 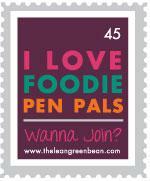 For today’s WIAW Party, hosted by Jenn, I’ll be showing you my meals from the first three days of the plan. 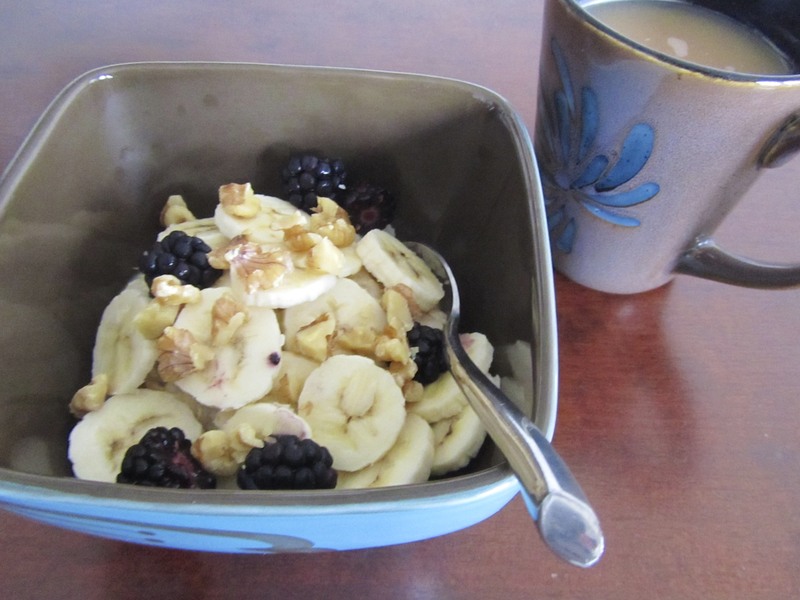 Sunday morning I topped a bowl of oatmeal with half a banana, berries, and chopped walnuts. I’m cutting back to just 1 cup of coffee while on the cleanse, so I paired my oatmeal with a cup of tea. I indulged in my one cup of coffee for the day before heading into the grocery store. Limiting my coffee intake makes me savor it so much more! 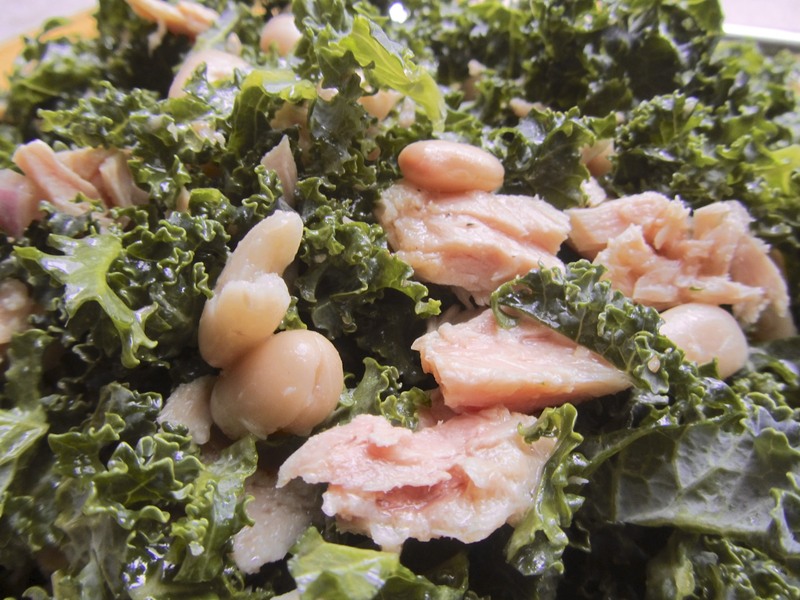 For lunch, I had a kale salad with tuna, white beans, and homemade sherry vinaigrette. 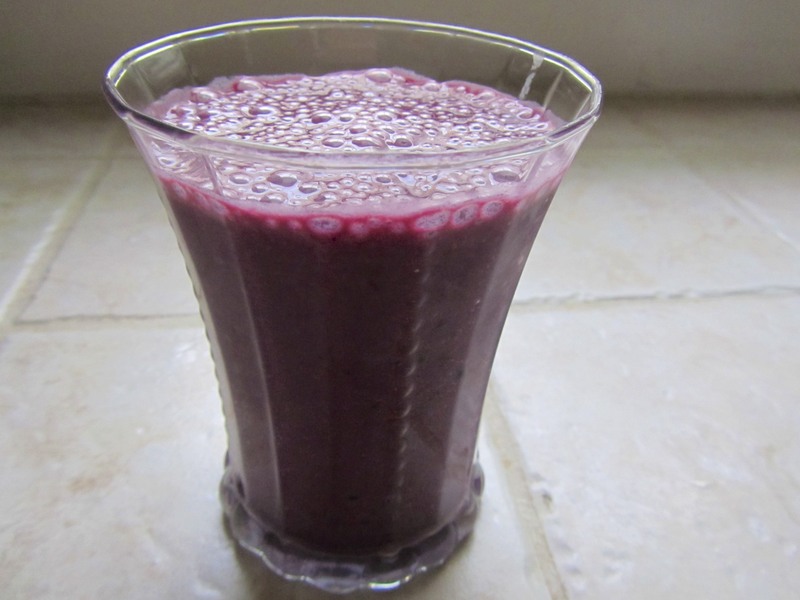 I had an apple-blackberry smoothie, modified to use soy yogurt instead of normal Greek yogurt, as an afternoon snack. Yum! Dinner the first night was delicious! 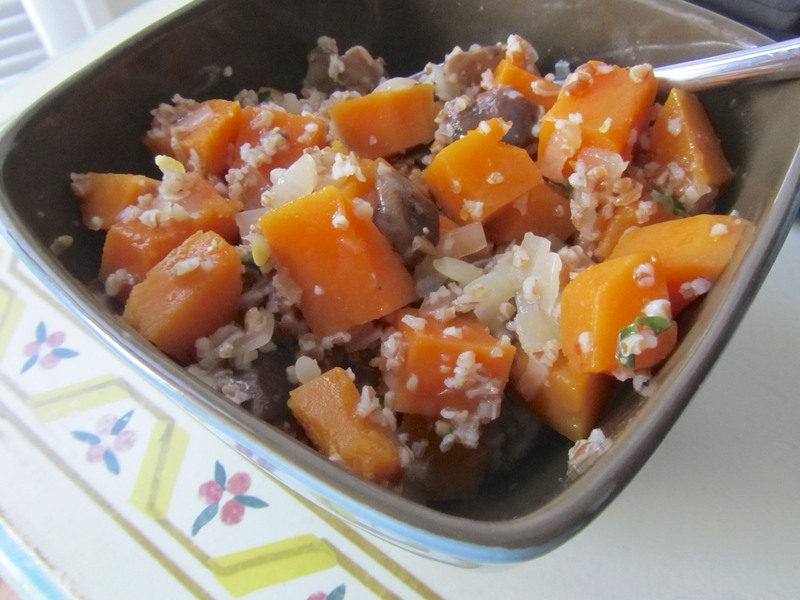 I made butternut squash-shiitake ragout and bulgur with parsley and lemon zest. I ended the night with a dessert of fresh fruit. I had an early morning shift Monday, so I packed up breakfast and lunch the night before. 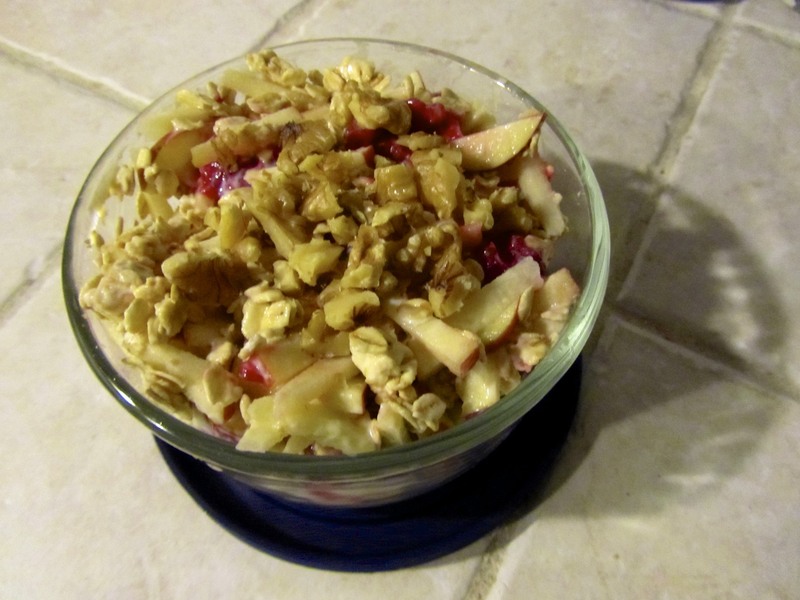 Breakfast was a tasty bowl of muesli, made with oats, raspberries, half an apple, soy yogurt, fresh squeezed orange juice, and walnuts. 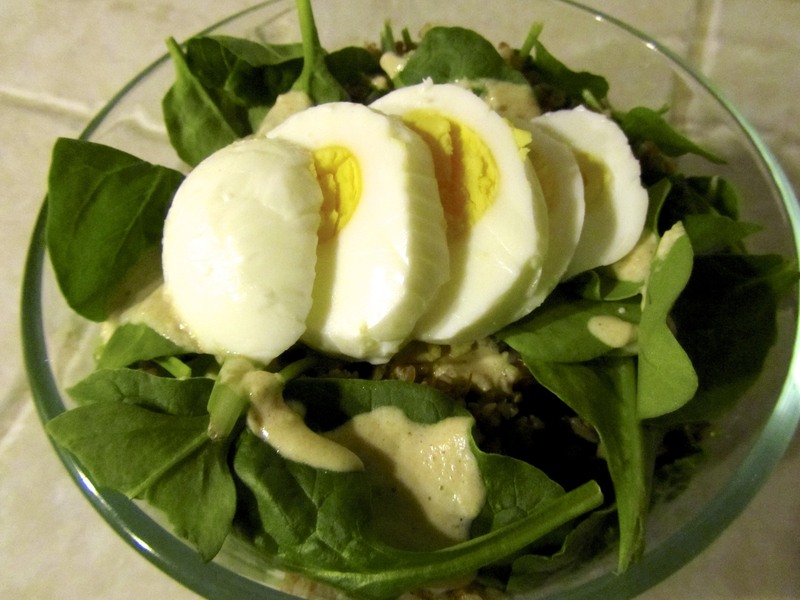 Lunch was a spinach salad with lemon tahini dressing, topped with a hard boiled egg and some leftover grains. 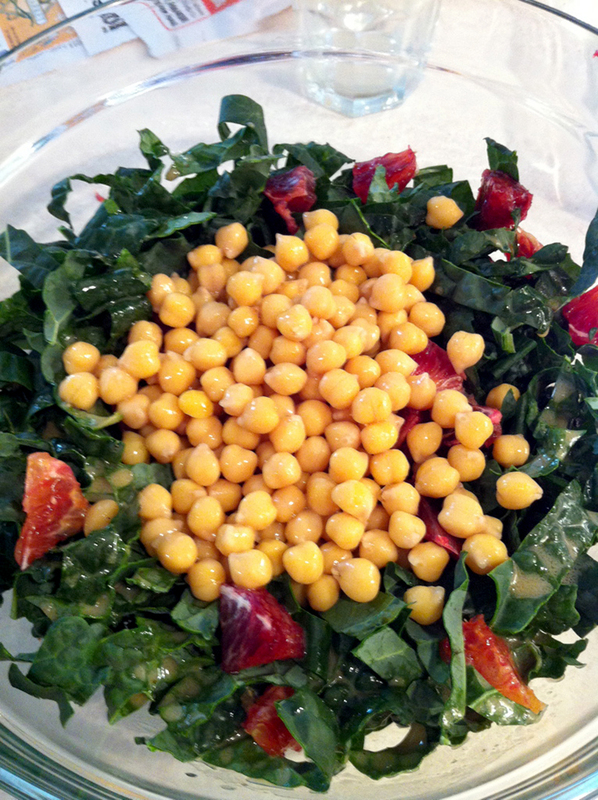 I love the lemon tahini dressing! For dinner, I had a bowl of leftover ragout and bulgur. It was just as tasty the second time around. I enjoyed another dessert of fresh fruit before hitting the hay. I normally go for sweet breakfasts, rather than savory, so I was surprised by how much I enjoyed the breakfast for day 3! 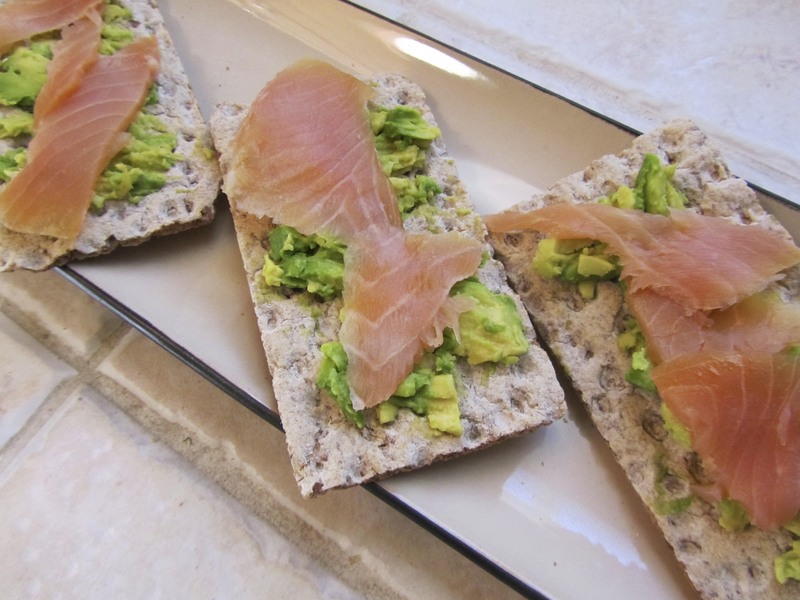 Mashed avocado and smoked salmon atop rye crackers made a very tasty meal. I snacked on a hard boiled egg before a noon ballet class. Hard boiled eggs are another simple food that I often forget, but always enjoy! 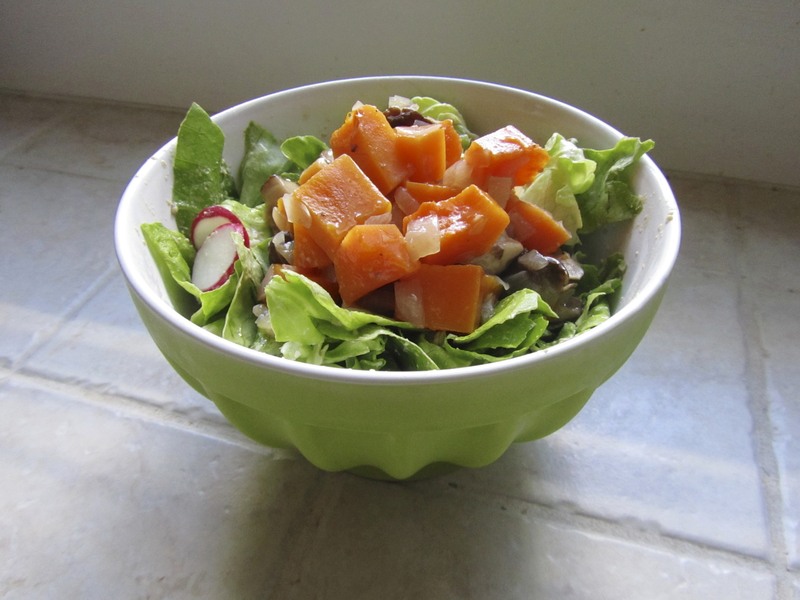 I opted to combine the butternut squash ragout and butter lettuce salad in one big bowl, rather than serving them side by side. 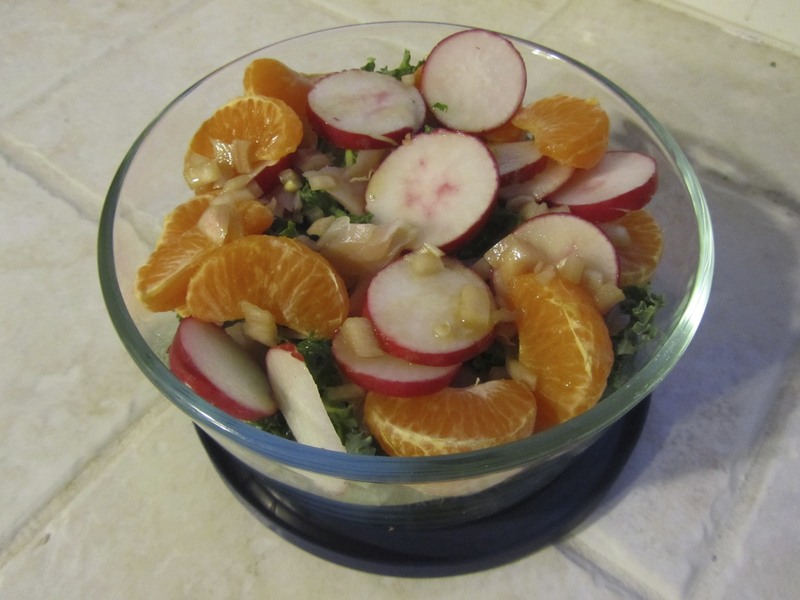 Topped with sliced radishes and lemon tahini dressing, this salad was filling and full of flavor. I “cheated” on the cleanse for dinner, and instead went out with a friend to discuss her wedding plans! I’m thinking of this cleanse as the start to some permanent changes in my diet and lifestyle, so I am not being too rigid with the rules. I am eating mindfully, avoiding processed carbohydrates, cutting back on sugar, and decreasing my alcohol and caffeine intake. That sounds pretty clean to me! I am moving away from San Francisco at the end of May, so I’ve been trying to enjoy the city as much as possible. I have an ever-growing list of places to go and people to see! I’ve balanced my galavanting with extra shifts at work, and while it’s been nice to be able to fund my frolics, I have no time left to take care of myself. These days, I feel accomplished if I eat 2 homemade meals a day. I modified a recipe from Bon Appetit to make a quick and easy lunch dish earlier this week. This pasta salad of sorts can be served warm or cold. 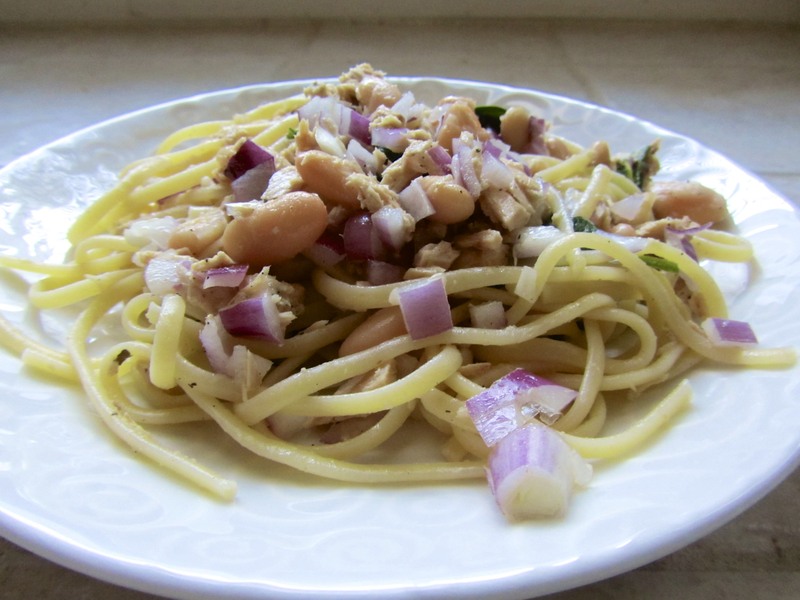 If serving warm, I’d suggest sauteeing yellow onion and wilting the spinach, rather than fresh red onion and greens. I did a sort of awkward in-between version with wilted spinach and raw red onion. 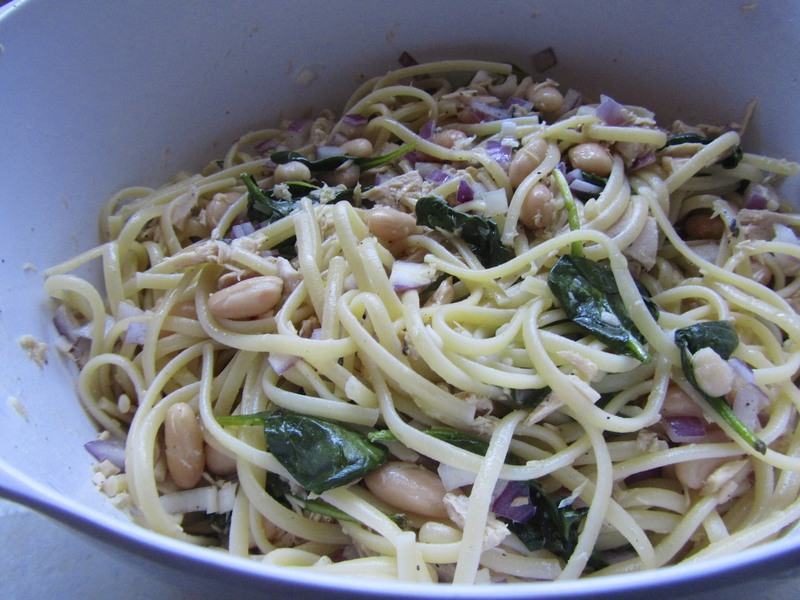 You could also mix things up by using whole wheat or spinach noodles. Cook pasta according to package instructions. Drain and rinse under cold water. Meanwhile, whisk olive oil, lemon juice, garlic, salt, and pepper in a large bowl. Flake tuna into the bowl. 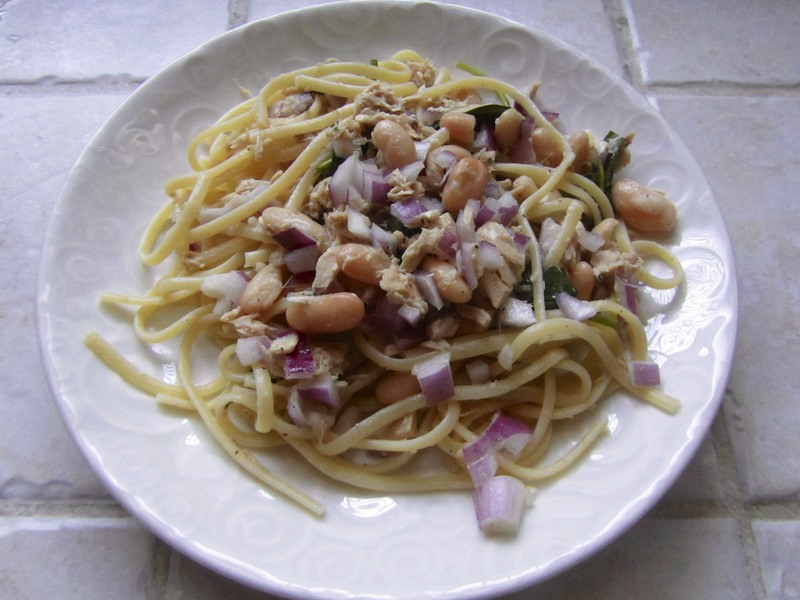 Add spinach, pasta, beans, and onion. Toss gently to coat. Season lightly with additional pepper. This was a great meal to pack up and take to the studio with me. 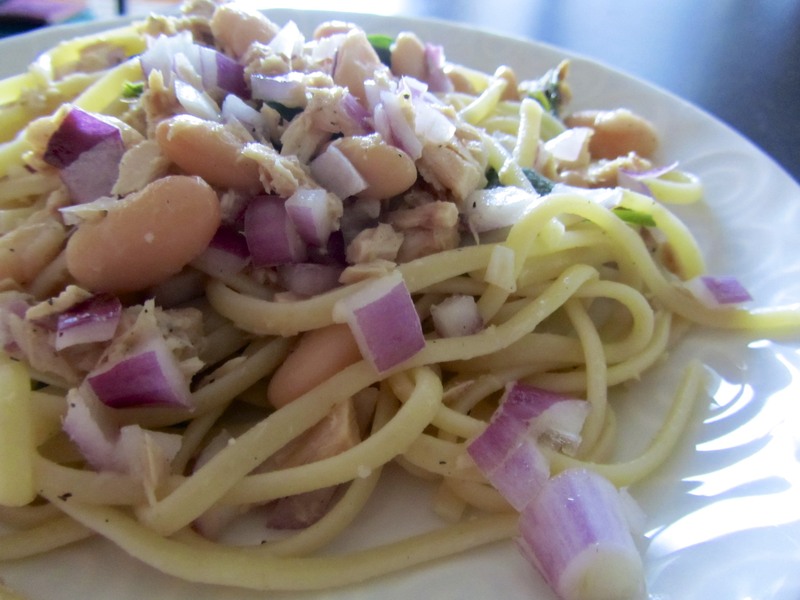 With beans and tuna, it’s full of protein… Just what I need when I’m on the run! I’m looking forward to a day off on Sunday. I’m having some friends over for brunch (Tiramisu pancakes! ), and then intend to spend the rest of the day in the kitchen. I’ll get ready for another busy week by preparing some nice, healthy, home cooked food! Spending hours in the kitchen not only results in food that nourishes the body, but it is a process that nourishes my soul. It is time that allows me to disconnect from technology, from other concerns, and to focus on the task at hand. It is also a time for me to experience powerful learning moments. In the kitchen, I have learned the value of process, as well as the value of failure. Most recently, I have been reminded of the value of patience. Weeks ago, I picked up a bag of hazelnuts at the store, thinking about how incredible it would be to make hazelnut butter. Hazelnut butter soon turned into Nutella. 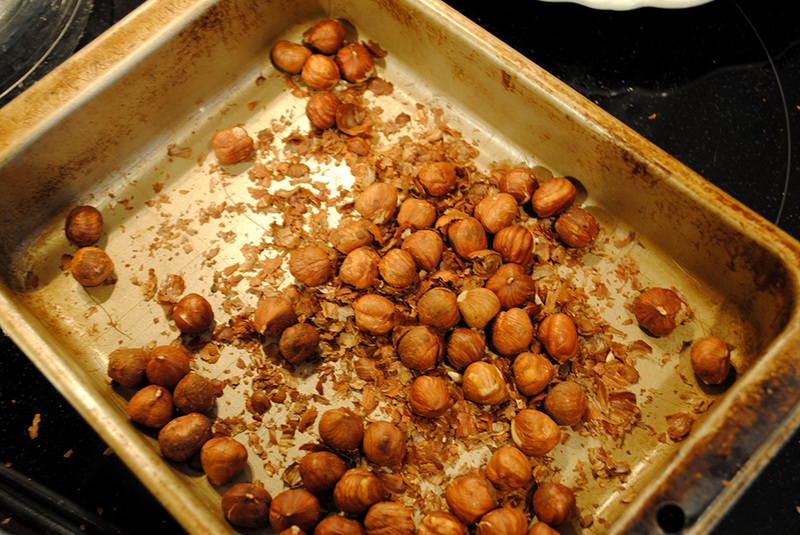 So, last Saturday, after breakfast and crosswords with my husband, I placed 2 cups of hazelnuts into the oven for a quick 10 minute roast in order to loosen the skins. 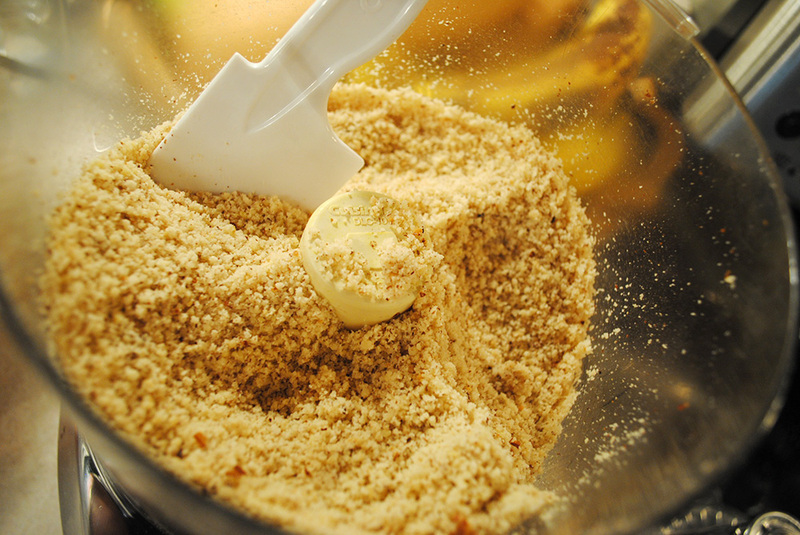 I slowly and painfully** rubbed the skins off of the nuts, and placed them into the food processor. **Do not do as I did and use your bare fingers…it will create a slight blister. Use the “kitchen towel” technique! Curious to learn where I went wrong, I sat down and started to research (something that would have served me well before my experiment began…). I learned from Oh She Glows that I lacked the necessary patience. Getting the mixture to that creamy place can take a full 15 – 20 minutes of constant processing. So, my failed attempt at making Nutella, just like my failed attempt at making yogurt, was due to a lack of patience… And yet, the next day, I sliced, roasted, peeled, chopped, and simmered ingredient after ingredient to make a delicious, healthy, and hearty quinoa, cabbage, and kale salad, inspired by Ashley’s quinoa salad and Sarah B’s braised cabbage. I documented the process with my iPhone, and the finished result was so beautiful, I just had to take some “real” photos to share this creation. 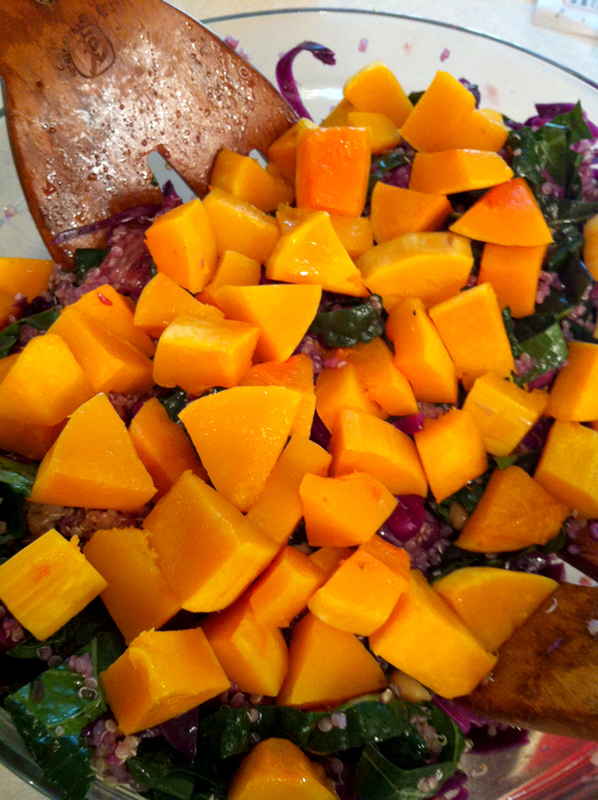 On a slow Sunday afternoon, creating this colorful salad was a labor of love. A 3 pound head of cabbage (the smallest I could find) is a LOT. I braised the whole head, but used only about half in this salad. 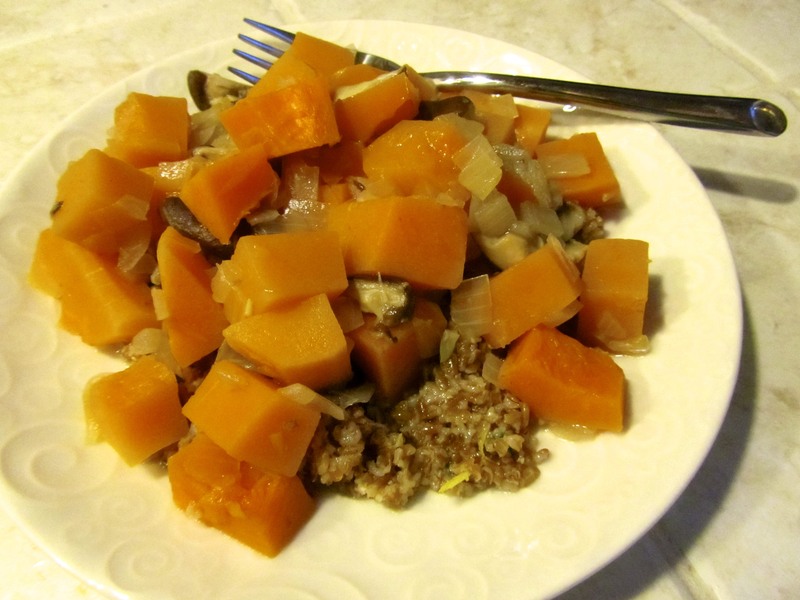 Butternut Squash – Cut in half and roasted for 10 minutes, then seeded, peeled, and cubed, and roasted for an additional 15 – 20 minutes. 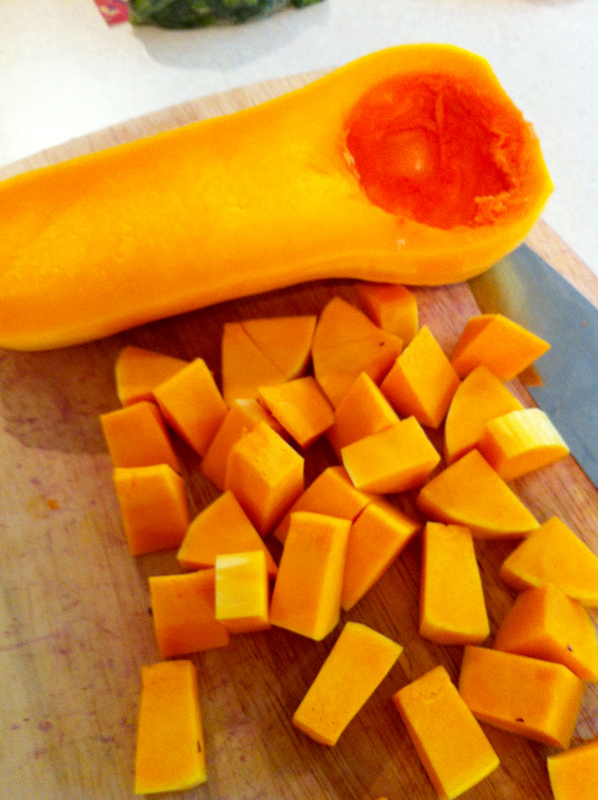 Squash is easier to deal with once it is softened. 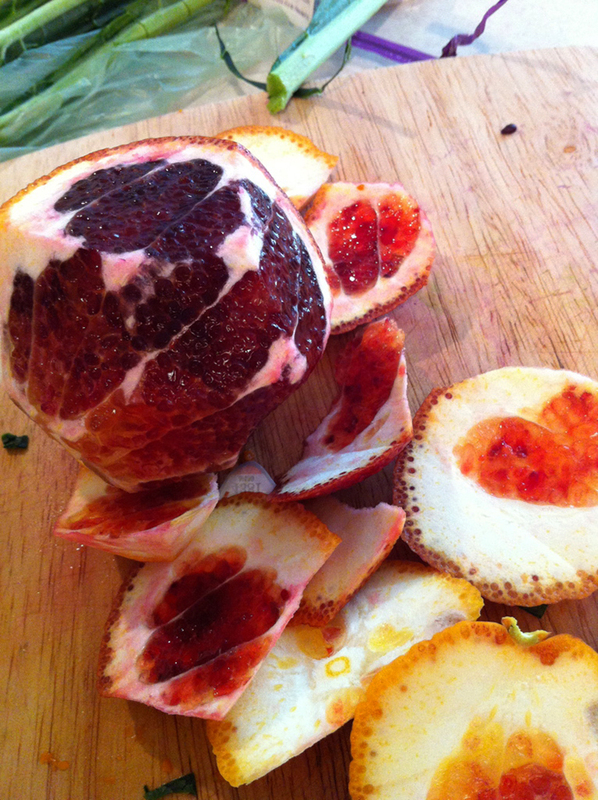 Blood oranges are so beautiful – one of nature’s many delights! 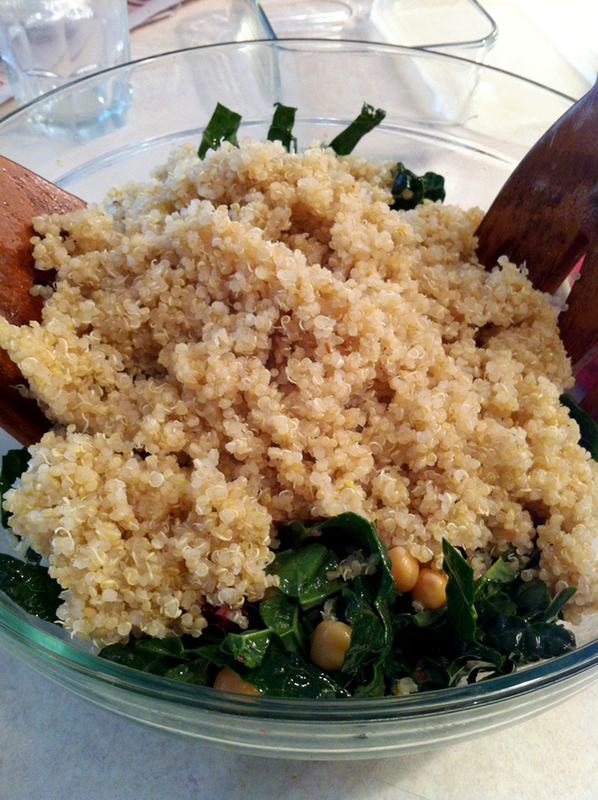 I took at least an hour preparing this hearty salad that provided me with meals all week long. It occurred to me after the fact that while I continue to procrastinate my experiments in bread making because “it takes too long,” the active time to make bread is far less than the time I spent making this “easy” salad. It’s all a matter of perception, I guess. Something about working with vegetables relaxes me. I love chopping them. Fresh herbs, however, often intimidate me with their “laborious” preparation process (i.e. 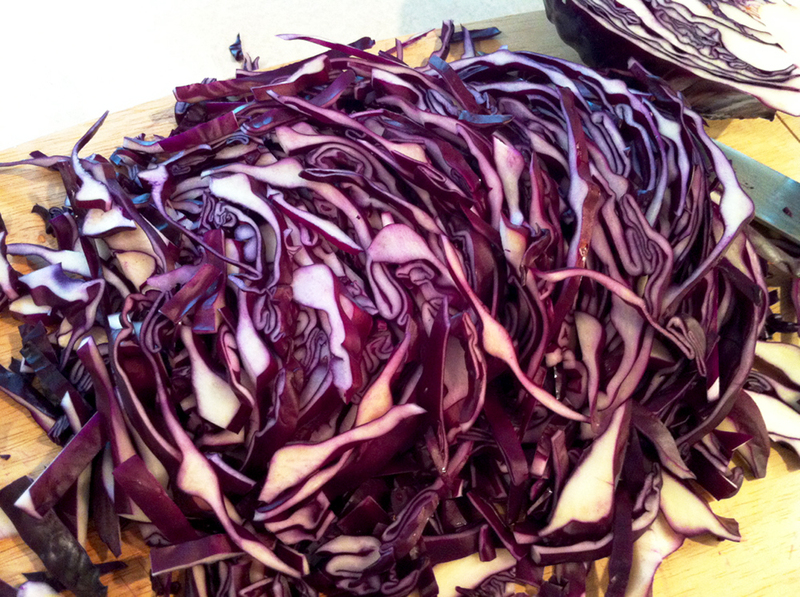 washing, drying, and chopping). Clearly, my mental perception is slightly skewed. Awareness is the first step, though, so fresh herb chopping and bread making loom on the horizon. 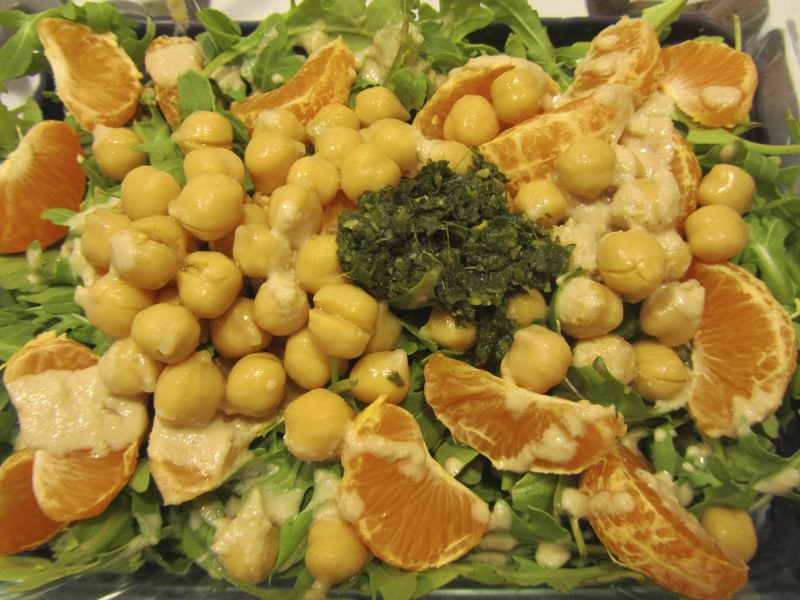 Perhaps because of the time and attention it took to prepare this salad, I delighted in eating it for lunch or dinner each day last week. My patience was rewarded! 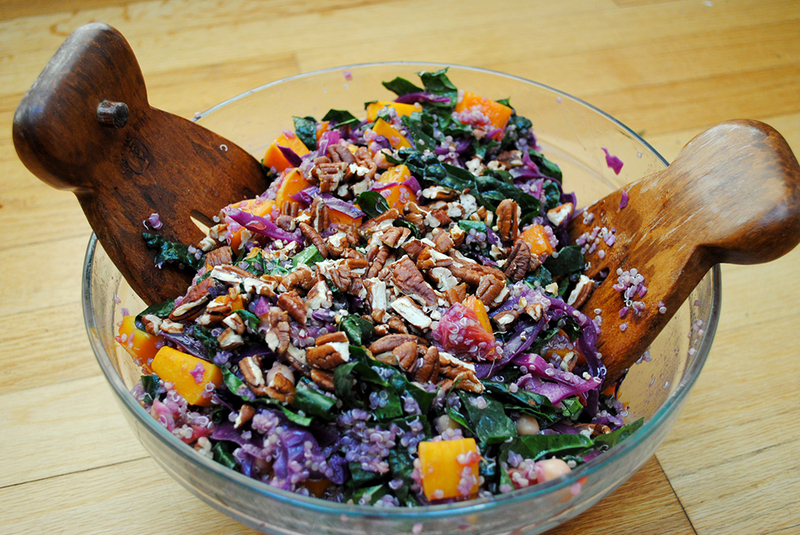 With so many textures and flavors, this salad was great. I look forward to repeating it with variations here and there. What lessons have you learned in the kitchen?